"Hinamatsuri (Doll's Festival)" is held on March 3rd. This is a day to pray for young girl's growth and happiness. It is also called "Momo no sekku (Peach Festival)" because of the peach blossom season on the old lunar calendar. May 5th is "Kodomo no hi (Children's Day)," and this is so called "Boy's Festival." While Children's Day is a national holiday, Hinamatsuri is not. Most families with girls display "hina-ningyo" (special dolls for Hinamatsuri, see the photo below) and dedicate peach blossoms to them. They are usually arranged on a five or seven-tiered stand covered with a red carpet. At the top are the Emperor and Empress. The next step contains three court ladies (sannin-kanjo), followed by five musicians (gonin-bayashi), two ministers (udaijin and sadaijin), and three servants ending the bottom row in a five-tiered display. There are also small pieces of furniture, small meal dishes, and other things. * She sits down while the others stand up. 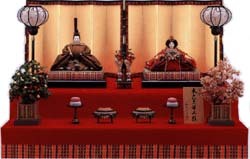 * Both ookawa and kotsuzumi play their instruments standing up. * He has a folding fan (sensu). * The left was considered superior in the old Japanese court, therefore an elder man known of his wisdom was often chosen for this position. This is why a sadaijin doll has a long white beard, and looks older than a udaijin doll. Ukon no tachibana （右近の橘） - A mandarin orange tree. * It was always planted to the right in the old Japanese court. Sakon no sakura （左近の桜） - A cherry tree. * It was always planted to the left in the old Japanese court. Since this is a Peach Festival, it is often substituted with a peach tree. The dolls wear beautiful ancient court costumes of the Heian period (794-1185). The costume of the Empress is called the "juuni-hitoe (twelve-layered ceremonial robe)." Even today the juuni-hitoe is worn at the Royal family's wedding ceremony. Most recently, Princess Masako wore it on the wedding of the Crown Prince in 1993. When wearing the juuni-hitoe, the hairstyle is gathered at the neck to hang down the back (suberakashi) and a fan made of Japanese cypress is held in the hands. A traditional set of dolls can be very expensive. There are various grades for the sets, and some full sets cost more than a million yen. Unless there is a set handed down from generation to generation, grandparents or parents buy them for a girl by her first Hinamatsuri (hatsu-zekku). However, since many Japanese live in small houses, royal couple version (with only the Emperor and the Empress dolls) is popular nowadays. There is a superstition that if you don't put away the hina-ningyo soon after March 3rd, the daughter will get married late. There are some special dishes for the festival. "Hishimochi" are diamond-shaped rice cakes. They are colored red (or pink), white, and green. The red is for chasing evil spirits away, the white is for purity, and the green is for health. "Chirashi-zushi," "sakura-mochi (bean paste-filled rice cakes with cherry leaves)," "hina-arare (rice cake cubes)" and "shirozake (sweet white sake)" are also often served. 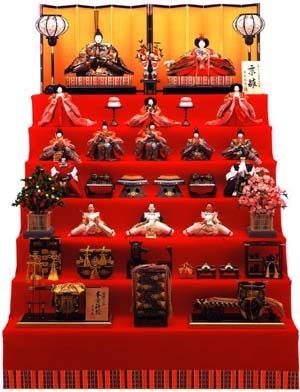 The origin of Hinamatsuri is an ancient Chinese practice in which the sin of the body and misfortune are transferred to a doll, and then removed by abandoning the doll on a river. A custom called "hina-okuri" or "nagashi-bina," in which people float paper dolls down rivers late on the afternoon of March 3rd, still exists in various areas. Here is a Hinamatsuri song called "Ureshii Hinamatsuri (Happy Hinamatsuri)." "~ mashou （～ましょう）" is a verb ending that indicates the person's volition or invitation in formal situations. It is similar to the English expressions of "Let's ~."